That age old battle. Okay, maybe it isn’t age old. Maybe it is just half a century old. Hey, maybe it is even just a quarter of a century old. However old it may or may not be, it is a battle. What do I let my girl read (or play with) that will develop her sense of “girl power”? What are great picture books for a girl to read that will inspire her to be a strong girl? I am no feminist. Not in the bra-burning sense. I am a stay-at-home mom, after all. I have no shame in being “just” a mom. But I do believe in girl power. I do want my girls to grow to be strong women. I want my girls to aim for whatever goal they can think of, and I want them to be able to achieve that goal. I want them to be capable of being fully independent. Let’s take this back a notch. I want to remind you that books can be just fun. Books can be about princesses and girly things. Books can also inspire. Books can plant seeds of what can be. Books can lead us to our dreams. 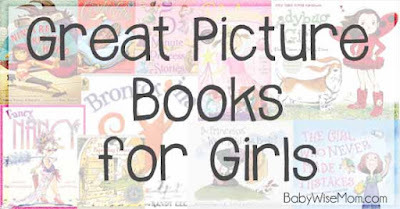 These are books that tend to appeal more to the girl crowd. Boys can definitely enjoy them, but you will find they attract girls more than boys. 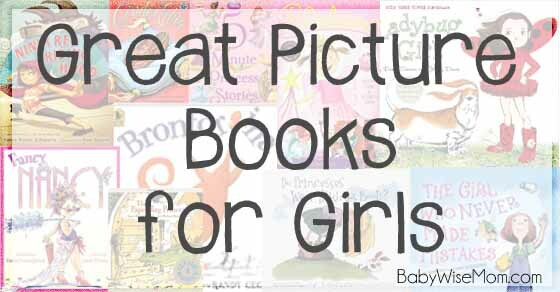 If you have girls, these books are worth owning. If you have only boys, you might want to borrow from the library first and see what your boy thinks. This post contains affiliate links. This is a current favorite of Brinley’s (age 3). Not only does Red have the power to take wolf down, so does Granny. No woodsman required. Wolf also learns to be kind to others. I love all of the -licious books and buy each one as it comes out. They are more girly, and that is okay with me. Some girls are naturally more girly and I am happy to nurture that girly side. They aren’t just girly, though. Each one has a different life lesson to teach. 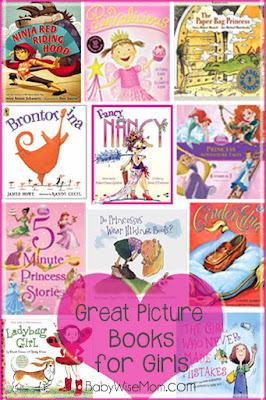 Speaking of girliness, Fancy Nancy takes the cake for the girly books. Nancy is also a strong female and shows that you can be intelligent and like to be glamorous. It is a great series for building vocabulary, too. This princess, in a dragon-guarded tower, ends up needing to save her prince after events take an unexpected turn. Ladybug girl is probably the least girly of all of these books. It is more a book series about holding on to the magic of childhood. It encourages independence, which I love. If your boy loves the concept of the book but is less interested in a female protagonist (it happens), try Bumblebee Boy by the same author. Ladybug Girl also has a set of my favorite board books. This is a really fun book with various stories of the Disney princesses in empowered roles. This is great for the girl who loves princess and also loves adventure. The story of Cinderella has many twists in many different stories. This one follows two girls, neighbors, Cinderella and Cinder Edna. Cinder Edna rescues herself from her bad situation. I love this story. This is a story of a girl who wants to be a ballerina, but has to overcome not fitting into the common size stereotypes to achieve that goal. Sometimes you just want a girly princess story. These stories are not just about helpless princesses, though. The princesses are independent. They are stories based on your little girl’s favorite princesses. This is a fun series about different quandaries about what a princess is like. Is a princess even a real person? This series brings to light that they are indeed real. This is a story about the plague of women everywhere: The pursuit of perfection. It teaches about making mistakes and being okay with that, which is an important lesson for females of all ages. Thanks for the suggestions! We've got 4 girls and have read a few of these, but not most of them. I just put them all on hold at the library.